If one were to conduct a public opinion poll on Genghis Kahn today, chances are the most frequent descriptions of the man would consist of terrifying leader, murderer, pillager and barbarian. Yet, after viewing Russian director Sergei Bodrov’s Mongol, the first work of a planned trilogy about the controversial leader born with the name Temudgin, my initial reaction was that perhaps all Kahn needed was a good public relations team to turn worldwide frowns upside down. In showing us the softer side of Kahn as a predominant lover who occasionally fights rather than a horrifying fighter who sometimes loves, one encounters a Kahn who wouldn’t be out of place as the lead hero in Gladiator or Braveheart, and even far more surprisingly, incidentally a man one wouldn’t hesitate to bring home to mom. Kazakhstan’s official selection for the Best Foreign Language Film category of the 2008 Academy Awards where it made the international cut to become one of five prestigious nominees, Bodrov’s film has drawn countless parallels to old fashioned epics with its grandiose scope and wonderful usage of a vast, overwhelming landscape (painstakingly accurate in its cinematography of Kahn’s old stomping grounds in the countries of China, Mongolia and Kazakhstan). While one is instantly aware of the influences of Ridley Scott especially in some of the expressionistic, alternatively fast and slow motion new aged battle scenes wherein the audience is shown the action from the point-of-view of weaponry as though we’re complicit in the attack, I was also struck by Bodrov’s homage to other foreign masters including Japanese filmmaker Akira Kurosawa’s work with Toshiro Mifune and especially fellow Russian director Sergei Eisenstien’s much imitated classic Alexander Nevsky. 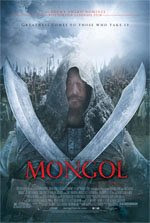 While admittedly I’m probably the ideal viewer of Mongol with relatively zero knowledge about Genghis Kahn other than his oft-cited reign of terror and it’s obvious that liberties were taken with the facts for the benefit of the cinematic narrative, Bodrov’s aim is undoubtedly true in capturing the spirit of his source material, which is not only based on “leading scholarly accounts” according to the press release but as cited in a Wikipedia referenced interview, was additionally inspired from an ancient Chinese poem which chronicled-- similar to Mongol-- Kahn’s upbringing and marriage. Opening in the Tangut Kingdom in 1192’s Year of the Black Rat, the nine year old Kahn, then named Temudgin (played by the charismatic young Odnyam Odsuren) accompanies his father to visit the Merkits with the intention of choosing a bride. Immediately thunderstruck by Borte, a bold ten year old girl who initially chides her new acquaintance with the adage that all “smart people choose us for brides,” later, liking his face and similarly in-tune with the lad, she adds the fortuitous afterthought, “you should choose me.” Ignoring his father’s advice to ensure he find a wife with the right description of facial features and one with what his dad repeatedly states has strong legs to keep a man happiest, Temudgin settles on Borte with the intention to marry her in five years. However, his future becomes dangerously uncertain after the death of his father finds him fighting to stay alive verses his people’s arch enemy Targutai (Amadu Mamadakov) who is not only hell bent on taking over as Kahn but promises that-- while he won’t break Mongol tradition and murder a child-- as soon as Temudgin comes of age, he will kill the rightful heir to the leadership. With plenty of perilous adventures, near misses, abductions and escapes, Temudgin grows into the beginning of the quick thinking legend he would become as—and now played by the impressive Japanese star of Zatoichi, Tadanobu Asano—he finds he can finally marry his equally rebellious tomboy beloved Borte (likable newcomer Khulan Chuluun). However, unfortunately for the newlyweds, their relationship is continually tried with repeated captures and obstacles, none greater than Temudgin’s battles with his blood brother turned rival Jamukha (Road Home star and Mongol scene-stealer Hanglei Sun). Although the film stumbles considerably in its second half with plodding pacing and a lack of the same take-no-prisoners emotional investment it slayed us with in its first opening sequences, Bodrov more than redeems himself with his expertly staged Eisenstein inspired battle sequences and the stunning photography from two distinctly different cameramen including Russian cinematographer Sergei Trofimov and Quills and Disturbia Dutch veteran lens-man Rogier Stoffers. Above all Mongol is surprisingly romantic and thankfully intimate for a large scale epic where oftentimes the individual characters get sidestepped in preference for the impact of the bigger picture and emphasis on carnage and casualties. And while it’s a far more sensitive and charismatic Kahn to which history enthusiasts are accustomed, it’s a terrific achievement by Bodrov and one where, given the impressive footing he found right out of the gate, he’ll undoubtedly be able to build off of like a Kahn worthy war strategist in the next two installments to cross the trilogy's finish line with unsurpassed style.